Have you ever been to a doctor’s practice where you could see another patient’s x-rays or hear about or even see test results of a patient? Here’s a great example of what Screenflex portable walls can do for you. See how Screenflex helps to protect patient’s HIPAA rights at The American Cardiology and Nuclear Practice in Maryland. Privacy and security safeguards are in place for your personal health information through HIPAA which is the Health Insurance Portability and Accountability Act of 1996. HIPAA keeps information in your medical records safe as well as protecting conversations between your doctor regarding your treatment. HIPAA also protects your billing information and any medical information in your health insurance company’s computer system. At the American Cardiology and Nuclear Practice, Dr. Hassan Kassamali puts forth every effort to keep his patient’s medical records from incidental disclosures. Dr. Kassamali purchased one 6’8″ H x 9’5″ L Screenflex portable wall to keep imaging and patient records from being seen by people passing by. Nuclear Cardiology testing takes around an hour. 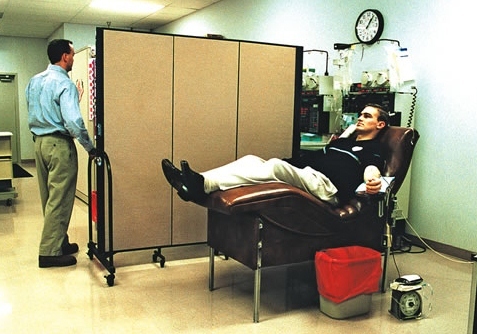 Patients need to lay on a nuclear table for the duration of the test. Images are taken of the heart after the dye has gone through the patient’s system. When the dye reaches the heart, scans of the heart are taken. Patients feel more comfortable with the portable wall which creates a cozy feeling. Office Clerk shares: The divider is working out wonderfully! Screenflex portable walls are flexible, versatile and economical. Screenflex even helps to protect your HIPAA rights. How does Screenflex help you provide the perfect space you need?